I wish I would have seen it earlier! We had a talk with Mica this morning about the tragedy that struck in Connecticut. I had not heard about the tragedy until later in the day on Friday. I was worried about getting all of my grades done for the semester. When I heard about all the children that passed away, the grades that I was trying to get done all day suddenly didn't matter as much. Life matters way more than anything else. We decided to talk to Mica and not to Isaak. Isaak's too young to understand death. 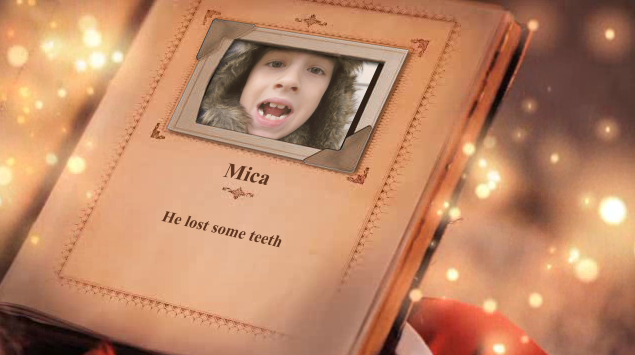 Mica's really too young as well, but he's exposed to different things at school. We kept things brief with Mica. We made it clear that if he had ANY questions to come to us. He didn't ask much of anything. We figured he'd hear about it on TV, radio or at school. I do have to say that we don't have the TV on all the time. We watch it mostly when the kids have gone to bed. The radio however plays in the car often. We'd rather be open with him; letting him know that he could come talk to us. We told Mica to not discuss this situation with his fellow classmates. I don't know if his classmate's parents will or will not have discussions with them. I like the quote of Mr. Rogers. 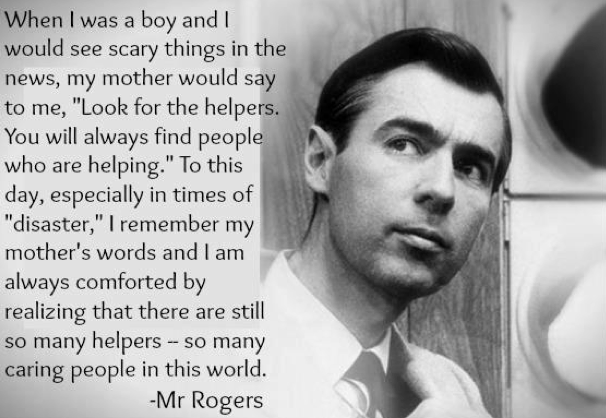 Looking for the helpers in a difficult time is so important. The teachers that day were helpers. They protected their students. Firefighters, police and parents later were helpers.There are still so many helpers in this world. If you don't know if you should or should not talk with your kids there are many sources out there. It's hard because even I as an adult can't understand everything that happened. I feel like it's just important to let my kids know that we are here to talk to. I'm adding to this post. Just like I feel for the families that were affected in Connecticut shooting; I feel for the shooters family as well. Mental illness is real. I think we try and push it under the rug. Health insurance won't cover many of their meds. It's so sad! I read an article about a mother who has a child that is mentally ill. You have to read it! It can be found here. Mica: "Mom is there any mail for me?" Mica: Stomped his feet and said, "You are so spoiled! You always get mail!" I wonder if he realizes that most of the mail is bills? I've been off and on listening to Peter, Bjorn and John. Their videos are pretty different. They have vector people singing in the song Young Folks. They released their first full album in 2002. It was a Swedish label. Most of their songs were recorded in Björn’s apartment. They had a major label debut; first released in UK/Europe/Japan/Australia in 2006 and then in the USA and rest of the world in 2007. Breakthrough for the band; the animated video for Young Folks really made a path for the band. The band formed in 1999 and threw a 10 year anniversary US tour in November 2009. The band was nominated for a MTV Music Award in 2007. Once, the band played a Chinese restaurant and fell through the floor. Who's ready for the holidays? This is a great giveaway for a last minute stocking stuffer. Ho Ho Ho, it’s the holiday season and that can only mean one thing… Shopping! One lucky reader will win either the Peanuts Deluxe Holiday Collection, or Classic Christmas Favorites Dr. Seuss's Deluxe Holiday Collection on Blu-ray! The prize will be chosen randomly by Warner Bros.
Disclaimer: The opinions on the post are my personal take on the product. This blog is a personal blog written and edited by me. I am not compensated to provide my opinion except for receiving the products themselves to test out. I did not receve a free product to help with this giveaway. If you haven't participated in Portable North Pole, it's a must for those that believe in Santa! First of all it's free. You just upload pictures of your kid or adult and fill out info on what Santa should say. I kind of forgot about it. That is until Mica asked about it. He remembered it from last year. A few days ago I got their Portable North Pole videos ready. Santa doesn't say, "Mica" right; he says it more like, "MeeCa" with a long "e". I even tried, "Micah"; it's still said, "MeeCa". I put in that Santa would say, "My Friend". Mica's name is visually throughout. 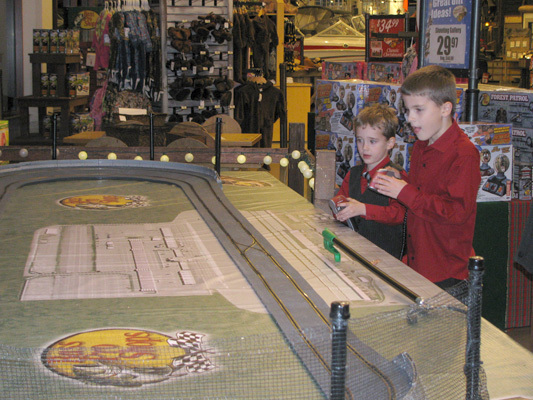 The boys totally loved it. They've asked to see their videos again. Their eyes light up when Santa says their name, finds their book and shows their pictures. If you want to send one to an adult you can. Last year I sent one to Daddy and it said that he was, "Naughty" for not having the Christmas spirit. This year I sent one to my co-worker. He was supposed to take photos of the student's movie posters. He had a student shoot a handful of images of himself. I had photos to work with. I had Santa say, "Your co-worker doesn't think you've done a very good job this year! You talk on the phone too loudly. You have to try harder to be a good employee." It was pretty darn funny! I had a few people in the office laughing when I showed it to them. The boys got to see Santa at the Bass Pro Shop. They told us when we got there that he was booked for the night. I was fully expecting that we'd just be able to look around. 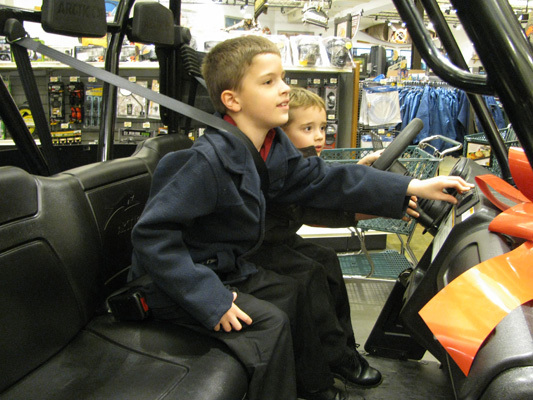 Then one of his helpers came up and said, "Do your boys want to see Santa? Go ahead, we got done early." Isaak got up on his lap all nice like. Mica on the other hand got right down to business. Before I could take a really good picture, Isaak got down and Mica kept on talking. 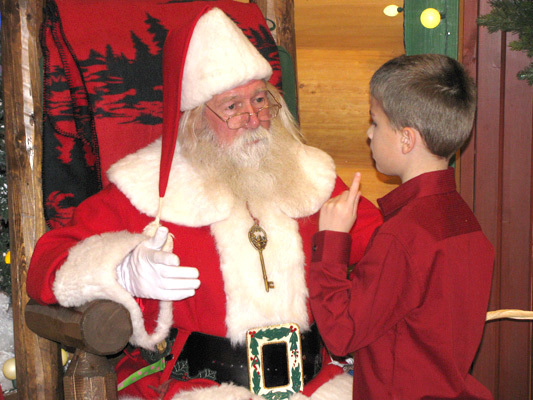 I couldn't hear what Mica and Santa were saying, but I could tell Mica was talking Santa's ear off! I envisioned Mica saying, "I want a Lego Ninjago Jay's Storm Fighter, a Lego Ninjago Book, you know the one, the Lego Avengers Quinjet Aerial Battle and a full sized drum set." Blah, blah, blah! I envisioned Isaak thinking, "All I want is a puzzle, but Mica won't shut up!" When Mica was done he said, "Santa seemed kind of tired." Gee I wonder why? I just told him, "Well he just got done seeing kids all day long. Santa probably was tired. If you have the time enter my low entries on my sidebar. 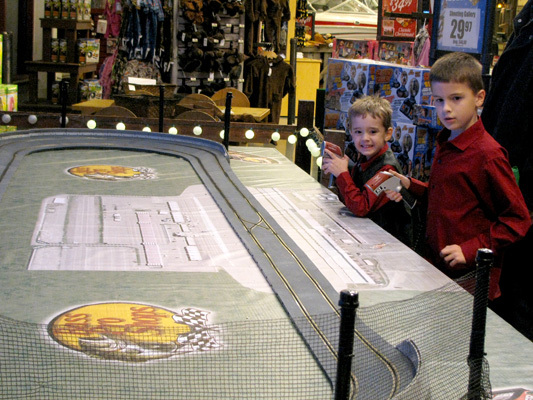 The boys love this race track at Bass Pro Shop! They couldn't wait to get their hands on the remotes! 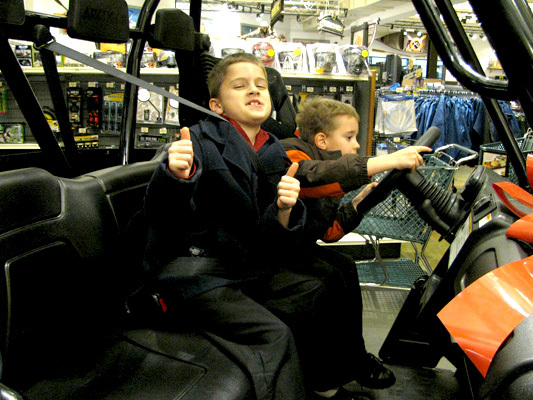 Maybe if Mica sticks his tongue out really far, that will make his car go faster than Isaak's. Today is one of those days, where little things are happening where I'm thinking, "What the ____?" I just got back from a grocery store run. I do that a lot during my lunch breaks. It's so much easier than taking the kids. Especially since it's now very cold out. I parked at the same time a guy does. He leaves his new truck running. I'm thinking, There must be someone else in there. Out of curiosity I sort of look. Nope! No one in there. I'm thinking, I hope he knows he left his truck running. The transit stickers are still on it. It would be pretty hard to track down a truck that has no license plate. That guy must be crazy! There have been news reports on vehicles getting robbed around here. Well the guy takes about as much time as I did in the grocery store. He came back to his truck; he didn't seem at all worried about his truck. He must leave it run all the time. I know Omaha is a smallish city, but I would never feel comfortable leaving my car run in a parking lot. A co-worker came up to me and said, "The student that was crying in our class last week now knows what is wrong with her." I said, "Do I want to know?" She said, "She happily said she's pregnant. Her Dad is concerned and her Mom has always wanted a grand baby, so she's excited." I always say, "Congrats" no matter what the circumstances are. This is the 4th pregnancy we've had in our small school this year. I'm beginning to think young girls do not know about birth control, or abstinence is. The crazy thing to me is not that they have gotten pregnant; it's that they think they can go on with school like normal right afterwards. Meaning no recovery time. Our school runs from 8:30 to 3:30. It's not a typical college where you can choose your credit hours, or go fully online. One girl just had a baby. She came in one day all frazzled and said, "My baby was up crying until 1 AM. I took her to the emergency room because something has to be wrong with her. She must be allergic to her formula." I wanted to say, "That's pretty normal. Just because she was crying doesn't mean she's allergic to her formula. She could have colic, she could be cutting a tooth, she could have an ear infection, or it could just be her fussy time." But I refrained. I bit my tongue and figured that I'd only give advice if she asks for it. Another co-worker told me last week that I should just be sick on the day of Isaak's preschool program. Hummmm...I know people do that. I just don't feel comfortable doing so. I got the time off by the way. He on the other hand hardly ever calls in when he's sick, or just doesn't feel like coming to work. Today he came in late because he was tired. No one knew where he was at. I'm thinking, "Really?!" Ok for some and not others I guess. Have You Sent a Child a Letter From Santa? Mica keeps asking for a message from Santa to come. I better get on it! A letter from Santa is Personalized with the Child's Name City and State. Give them a treasure that will last a life time. It's not too late to order your Santa letter or any other personalized letter for this holiday season! 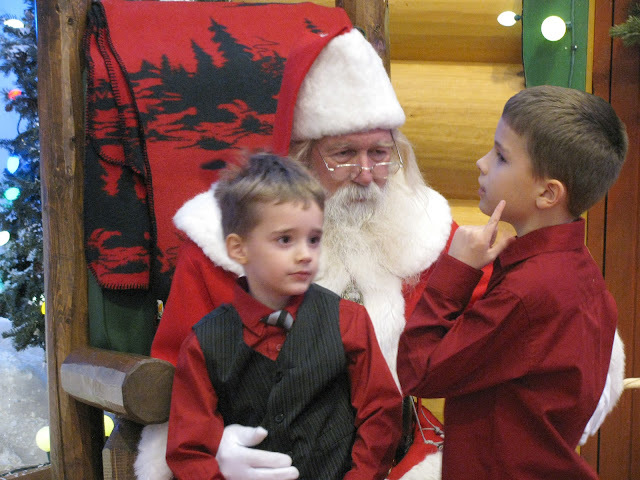 Isaak and Mica have seen Santa twice this year. Once at the mall. 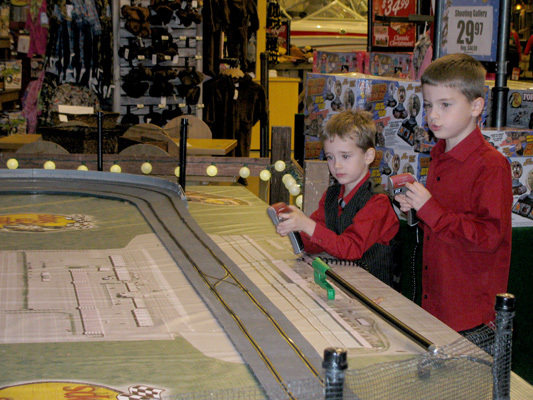 Then this weekend we went to Bass Pro Shop. We've never been there. They have such a cool set-up! They told us that Santa was booked for the night. Just as they were about to close, they let Mica and Isaak go sit on his lap. I'll have pictures put up for my WW, which ended up going up on Tuesday.